SLS Consulting $100 Gas Card Giveaway Has Arrived Just in Time for the Holidays! Do you get an uneasy feeling every time your car’s gas needle inches its way to “E”? If you hate filling up at the pump, let SLS pick up the tab! 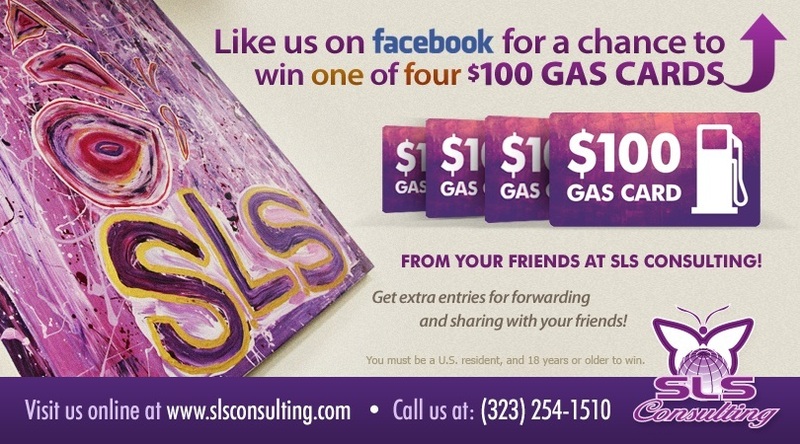 For four weeks in the month of October, SLS Consulting will be giving away a $100 gas card each week. To enter for your chance to win, visit our Facebook page and click the “Win a Gas Card!” image right below our Cover Photo. This giveaway is exclusive to our Facebook fans, so be sure to like our page on Facebook (www.facebook.com/slsconsulting) for your chance to win! Contest is open to all U.S. residents who are at least 18 years of age. Contest is exclusive to Facebook fans of SLS Consulting’s Facebook fan page (www.facebook.com/SLSconsulting). Winner will randomly be selected each Monday beginning October 8, 2012 (with final drawing taking place on October 29, 2012). Winner will be randomly selected by a computer program used to conduct the gas card giveaway. Entrant contact information will not be shared by SLS Consulting. No purchase necessary to enter. Chances of winning are dependent on overall number of entrants received throughout the promotion from start day of October 1, 2012 at 12:00am) to end day of (October 28, 2012 at 11:59pm). Bonus entries may be obtained by sharing contest with friends on Facebook. Facebook friends must enter contest via the link that entrants may choose to share with said friends at time of entry. All rights reserved. Void where prohibited.